From family-friendly minivans to sporty sedans to versatile SUVs, Honda offers a great lineup of vehicles that are designed to deliver reliable performance for a long time. What if you're interested in switching up what you're driving every few years though? That's where leasing comes in. By exploring what it takes to get ready and negotiate a lease that works for you, we hope to help you get a better rate. 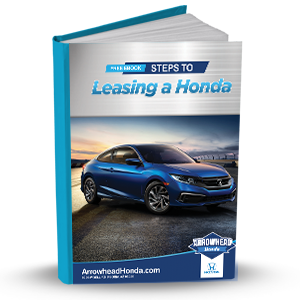 So, to get started, download our eBook on Steps to Leasing a Honda. Then, if you decide that leasing is for you, visit us at Arrowhead Honda to discuss lease deals near Phoenix, West Valley, and Surprise.